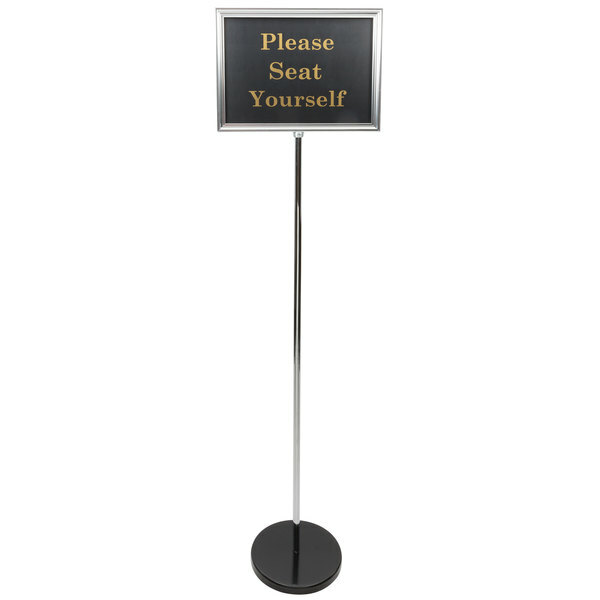 Help your guests get where they need to go with this Lancaster Table & Seating silver 60" changeable hostess / teller sign with 15 messages! Featuring a contemporary chrome-colored, lightweight aluminum construction and versatile 60" height, this sign ensures a practical, yet professional, addition to virtually any establishment. Use it in your restaurant, bar, cafe, or deli. It's great for catered events, too! It comes complete with 15 changeable messages on 8 signs (7 double-sided, 1 single-sided) that store within the frame for easy access, anytime.